FLIR Systems produces some of the most technologically advanced thermal imaging cameras. Their aim is to improve the way we interact with the world around us. Each product in the Ex Series aims at providing efficiency for a variety of applications. 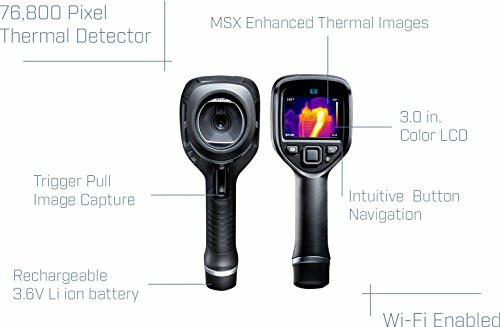 The FLIR E8 Thermal Imaging Compact Camera is a high-end handheld camera intended for everyday professional use. 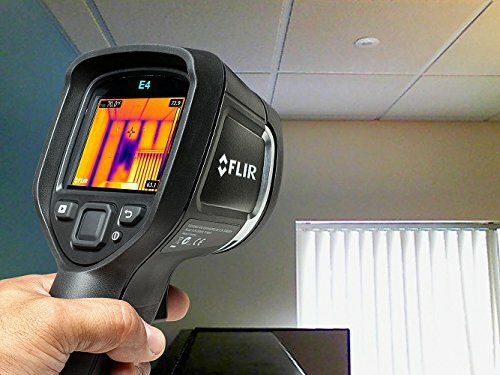 If you are in the construction industry where you need to perform building inspections, electrical inspections, or heating, ventilation and air conditioning (HVAC) inspections, the FLIR E8 produces dramatic images to reveal exactly where the problem is. It proves handy when you want to know any potential dangers in a system and need to alert the property owner so they can repair and in the process save them money. In the Ex Series, the FLIR E8 has the most advanced resolution and screen options. It gives you an advantage over other professionals when handling home projects, repairs, and even preventive maintenance. With 76,800 pixels, the thermal camera exceeds RESNET standards. It has a high-performance microbolometer detector which is very important in thermal imaging. A high number of pixels create more data points that provide more information for accurate thermal interpretation. It gives an excellent visual resolution so that you can discern fine details on the displayed image. For plumbers and building inspectors, you will be able to work from a great distance without losing temperature measurement accuracy. It gets you precise results even when it’s being used in extraneous backgrounds. It helps to discover weak points and abnormalities which can help owners and landlords avoid potential dangers or future issues with their property. With the FLIR E8, you get area box, center spot, hot, or auto measurement modes. It is a flexible means of measuring temperatures where with the area box tool; you’ll be able to hunt down temperature extremities. It features a color alarm where blue indicates readings below the set temperature and red indicates readings above the set temperature. It gives you reliable results on all measurement modes thanks to the fast temperature detection. Using a focus-free lens plus a single button, the FLIR E8 makes navigation a breeze. You can access all the on-screen settings, measurement tools, imaging modes and saved JPEGs with just one button. The button is large, easily accessible and can also be operated with a gloved hand. This thermal camera can capture and store visual, thermal, and MSX images (combination of visual and thermal images) with just a pull of the trigger. It shoots JPEG images which retain radiometric information on up to 500 images. A large field of view complements the E8 at 450 x 340 on a 3-inch screen. With a 9 Hz frame rate, it offers images on a browsable thumbnail gallery in gray, iron, and rainbow color palettes. It also offers picture-in-picture viewing which helps to give meaningful images in complex spaces like heat issues in an electric wiring box. When inspecting a thermal image, MSX comes in to give the exact details of that image in real time. This is Multi-Spectral Dynamic Imaging which embosses the digital camera settings on the infrared image, thus producing exceptional clarity. It provides an all-around thermal picture with numbers, labels, letters, textures, and other structural details such that the user can tell where the problem is exactly instead of having to compare multiple images. This also allows you to work faster as you can identify and pinpoint the location of a problem very rapidly. MSX allows the making of detailed conclusions by easing the process of target identification without compromising the integrity of radiometric data. 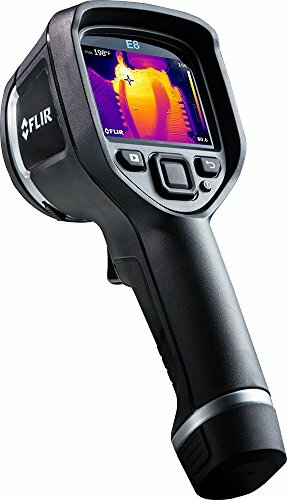 The FLIR E8 works perfectly between -40 degrees to 4820 degrees Fahrenheit. With this temperature range, it is expected to capture all scenes and objects that you expect to oversee on a regular basis. With its high accuracy levels, the FLIR E8 is great for a multitude of commercial uses, home uses and even firefighting. One of the premium features is the Wi-Fi capability. With either a network or peer-to-peer setup, you can share and send reports and images from a tablet or smartphone instantly. It is not impeded by location; thus decisions can be made faster and appropriate actions taken. All this is enabled via the FLIR tools mobile app. Weighing in only 1.27 pounds, the E8 is lightweight, and comfortable to carry all day. The handheld design means it stays put in your hands without being too heavy or cumbersome in your day to day activity. The E8 can withstand falls up to 6.6ft. You can feel the rugged industrial design in your hands from the rubber encasing to the built-in lens cap. These features help ensure that it can withstand daily use and justify the higher price you are paying for the E8. It also comes with a hard transport case so it is protected on the go. A tool-type, quick-release Lithium-Ion battery sits at the base of the device. It is effortless to remove and snap back in. The battery is rechargeable using a USB cable or on the optional charging station. It boasts 4 hours of operation time which is much higher than other IR cameras. FLIR covers their Ex-Series cameras with a 10-year warranty. You’ll have 2 years of coverage on the E8 parts, 5 years on the rechargeable battery, and 10 years on the detector. 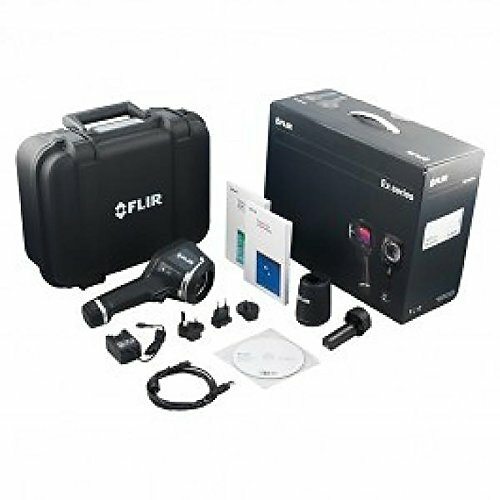 The detector is the most critical part, and FLIR ensures you get only top-quality from their brand. 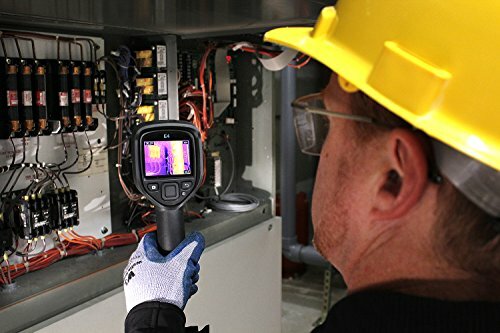 The FLIR E8 strives to replace the traditional IR thermometer with a much more advanced thermal imaging solution. It is a great option for troubleshooting potential dangers of abnormally high temperatures on electrical connections, fuses, and breakers. Its functionality also extends to the building industry to detect moisture intrusions, energy waste, heating and cooling malfunctions. The design includes multiple measuring and imaging options. The MSX technology helps to extract intricate details while picture-in-picture clarifies problem location. Wi-Fi and USB connectivity comes in handy when transmitting and sharing reports. If you are looking for a modern thermal imager camera for professional use, you have it in the FLIR E8.